UnBlogmysoul | Building Zion in our hearts and homes. On August 4, 2010, John Pontius said “Hello, World!” — his first “UnBlog My Soul” post. At that time, John had been told he had only six months to live. So, via the UnBlog, John recorded his powerful witness of Christ and of the gospel he loved. Even though he initially intended it only for his family and closest friends, the UnBlog grew in visibility and respect — much of it because John was a humble writer with a unique gift for teaching, preaching, expounding and exhorting all to literally and figuratively come unto Christ. Yet today, the UnBlog is undergoing a new and exciting phase. Effective today, the UnBlog has been frozen to future posts and comments. All content (pages, posts and comments) currently published on the UnBlog will remain online, but will not be added to from now on. Although I’ll never say “never”, I will say that it is not anticipated, nor intended, that the UnBlog will publish any more posts (there may be occasional announcements about John’s books, but these will not be content-based posts which allow comments). The reason for this is simple: “To every thing there is a season, and a time to every purpose under the heaven” (Ecclesiastes 3:1). Now is the UnBlog’s time to step back. It’s as plain and simple as that; no other motive than that. That’s right — if you are already blogging about the Gospel of Jesus Christ, fantastic! If not, then I join with Elder Bednar in inviting you to no longer light a candle and put it under a bushel (Matthew 5:15), but to “arise and shine forth, that thy light may be a standard for the nations” (D&C 115:5). Please give this some serious, prayerful consideration. You may be tempted to feel like you can’t do your own blog. Maybe you’re not a writer, you don’t have time, or you don’t know anything about blogging. I can relate; I didn’t feel I could, either. Technically, there are ample Youtube videos to show you how to start and maintain your own free WordPress or Blogger blog. Spiritually, you have an apostle of the Lord promising you profound blessings by sharing your voice online (especially read the last two paragraphs of Elder Bednar’s talk). And with the strength of the Son of God giving light and lift to your words, over time, He will help your online testimonies soar to heights that will astound you and inspire others. Of this I can testify. The Lord will also bring experiences to your recollection which will provide you with content ideas. Simultaneously, He will often lead people to your blog, where they will read your posts, contact you and exclaim, “You have no idea how much I really needed your post today!” It may take some time, but never despair — it will happen. He’ll also bring resources and people into your life, as He did mine, to help you easily clear any technical and content-related hurdle. The obstacles Satan will erect in your way are but illusions on your God-ordained path. The content which John and I, and everyone who’s posted or commented on the UnBlog, will also be here to help you, too. At the top right of every UnBlog page, just underneath the banner, is a search box with “Search UnBlogMySoul” above it. Just type the word or phrase you’re researching in the box, then click the “Search” button, and up will pop up every UnBlog post that contains that word or phrase. Under that Search box (on the right-hand side of every UnBlog page) is an “Archives” section. Here, just click the pull-down menu and select the desired month and year. The UnBlog will then display every post from that month and year, in reverse chronological order (newest at the top, oldest at the bottom). When you hover over the menu tab “Books, Downloads & More”, you’ll see sub-tabs for all of John’s books, free downloadable essays and audio recordings, and links to some meaningful videos which address Zion and some of the principles regarding it. Over the years, I have had the blessing of becoming familiar with other blogs which have an approach and content similar to the UnBlog’s. I enthusiastically recommend you visit the blogs listed in the “Recommended Blogs” section at the top right of all UnBlog pages. There are no mortal words or emotions to describe the profound gratitude we have for everyone who contacted us, commented on posts, attended the UnBlog Family Reunion, purchased books and CDs and attended firesides. These were all done with one and only one objective in mind: to help bring you closer to the Savior. Yet John’s and my highest degree of appreciation goes to our family and — as our extended family — those who actively administered the UnBlog since John’s passing. I have no doubt that your sacrifice and time, talents and energies will be rewarded beyond your wildest dreams by He who delights in exceeding our expectations. Finally, to our UnBlog family, I have a personal request: Please finish what “UnBlog My Soul” started. We would love nothing more than to see many, many more blogs emerge, actively encouraging anyone and everyone to “Come unto Christ, and be perfected in him” (Moroni 10:32). Not more than a year ago I believed the Lord would be there for us whenever we needed him, but that he really wouldn’t be involved in the details of our lives–like if we bought a car or other routine, worldly duties. I believed we should use our experience and knowledge to take care of these small (or large) tasks and leave the life-changing events to the Lord. My change started with a good lifelong friend of mine, Troy. Several years ago we had read “The Cleansing of America” by W. Cleon Skousen. Later Troy came across “Visions of Glory” and he instantly called me and bought me the book so we could read it at the same time. The similarities of these two books were amazing, and how both books came to be published is even more of a miracle. To me, this testifies to the truth of Spencers vision. Spencer’s vision helped me realize how much the Lord does help us and always provides the assistance we need, that angels are always standing by. We only need to come closer to the Spirit and constantly pray to overcome our fallen state to be in tune with that Spirit. Spencer also shared how quickly our thoughts can summon the souls that are trying to deceive us, and how important it is to constantly fight that influence. We need to surround ourselves with positive uplifting activities, and most importantly, service. After reading “Visions of Glory”, getting a glimpse into the building of Zion, and reading the many experiences revealed to Spencer and how close we are to the veil, I was changed. I looked at the world differently, I looked at people differently. The best way I can describe this is that I started seeing the world in a more eternal nature; the veil became slightly thinner to me. It made me realize how much I needed to change if I wanted to prepare myself or my family. Up to this point in my life I had been whatI call a part-time member: I went to church, paid my tithing and did OK in my callings. At this point I had also had plenty of trials and lessons in my life. I was a 42 year-old divorced father with custody of his kids. I was raised in the Church, and had had a life-changing moment where I was “born again” twenty years ago. Yet now for the first time in my life I looked forward to fasting, and fasted with a purpose. I put more dedication into my church callings. I prayed more fervently; instead of asking for what I wanted, I would pray for the path that the Lord wanted me to travel. I started teaching myself to pay more attention to the Spirit and try to discern my own thoughts from those of the Lord. I have received many experiences where I have identified the Spirit speaking to me, helping out in my everyday life. They were such small whispers that I would have previously missed them. One example is when I was working in my office and leaving for the day. I started to close the door when a simple command stated, “Don’t lock it.” I paused and sat there for a moment. I questioned my own thoughts on why I would think that, but I didn’t lock it. As I started walking to my car I realized my keys were still in the office. I normally kept them in my back pack but had taken them out to get into another door during the day and placed them on the desk instead of back where I kept them. This was by no means a life-altering event; at the worst I would have been delayed a few hours until I could have gotten the door unlocked. As a single father, I would have had to call and have a pizza delivered for the kids to eat. So why would I get what I felt was such an insignificant whisper from the Spirit? It was nothing more than an inconvenience that I was saved from. But since I had started listening to the Spirit, I quickly identified that it could have come from no other source. I had locked that same door every day, yet this time a simple command stopped me from doing what I had always done. It was at this moment I received my own testimony about what Spencer had described, which was how very much the Lord is involved in the details of our lives. The Lord is constantly giving us experiences and placing lessons before us to sculpt us into who He needs us to be. He loves us, He wants us to be happy, and by obedience to the Spirit we will be shown the way. Trials and burdens will still come upon us; Joseph Smith learned this in D&C 121 & 122. But instead of feeling regret, fear or despair, we will understand the reason why this trial was given to us, and what we should learn from it. Since making this change of heart, I find myself constantly recommitting to the life-long struggle of total obedience. As a result of that commitment, the missionary moments have increased, and I have more joy in my heart. I find more joy in service. I work to stay on the path the Lord wants me upon, and I find myself living without fear. There is nothing to be afraid of because you know you are supposed to be there. Such a small effort can make a profound change in your life. The reason I am sharing this story with you is a result of listening to the still small voice and making a comment to someone that needed to hear it. I didn’t even know at the time it was the whisperings of the Spirit until I received an unexpected response from the other person, confirming it to me. My friend Troy and I have made this journey together; we compare notes and see the significant changes in our lives. This is an amazing miracle that can only be experienced to explain. Thank you, Spencer, for sharing your eternal experience. Thank You, Brother John, for setting the example. Thank You, Sister Pontius, for carrying the torch. All of you have changed our lives and brought us closer to God. Note: This is a reader submission by a dear UnBlog family member, Veronica Clarke. Shortly after the death of my husband, I was awakened in the middle of the night with instructions communicated through the spirit by my husband. I took my iPad into the bathroom and began to type as they flowed. I typed as fast as I could until I literally felt exhausted and drained. The information was still coming, but I begged to be able to just rest for a while. I climbed back into bed and fell quickly asleep only to be awakened an hour later with more instruction. As a result of the experiences with spiritual communication right after my husband’s death, I have learned to keep a note pad or iPad near my bed. I have found that communication often comes to me after I have concluded my prayer and when I am in that sleep/wake period in the morning hours. Elder Scott also confirms spiritual communication that can happen during this period. He says, “Revelation can also be given in a dream when there is an almost imperceptible transition from sleep to wakefulness” (Richard G Scott, “How to Obtain Revelation and Inspiration for Your Personal Life”, April 2012). I think perhaps it is when my body is most still, that my spirit can take the forefront. I have also experienced this after fasting. Elder John H. Groberg shares this idea in his talk The Power of God’s Love. When the body’s senses are dormant because of lack of sustenance or shutting down from resting, spiritual senses can take the forefront. These are times when we can be more sensitive to, and perceptive of, the spirit. I have found that the words often start in my mind. If I do nothing and simply listen, I often fall back to sleep and forget what was being communicated to me. However, if I am diligent and begin to write, then the promptings continue and more and more is given to me. At times, I have written for several hours. The words flow easily, and I am learning as I am writing. When I go back and read what I am writing it is as if I have never read it before. The information is new and surprising to me and does not follow previous things that I have reasoned or thought on my own. These key things, in addition to the reverent feeling and peace from the spirit, tell me that this is personal revelation and not my own thoughts. Sometimes the information is for my personal enlightenment or to answer questions that I have been searching to understand. At other times, the information is things that I need to share with my children, with a friend that I am trying to help, or with people I am over in my callings. I find that information always comes easier when I am seeking for knowledge to help someone else. “When I am faced with a very difficult matter, this is how I try to understand what to do. I fast. I pray to find and understand scriptures that will be helpful. That process is cyclical. I start reading a passage of scripture; I ponder what the verse means and pray for inspiration. I then ponder and pray to know if I have captured all the Lord wants me to do. Often, more impressions come with increased understanding of doctrine. I have found that pattern to be a good way to learn from the scriptures” (Richard G Scott, How to Obtain Revelation and Inspiration for your personal life, April 2012). The death of my husband accelerated me on this track because I had a deep desire for direction and I was willing to sacrifice all practices in my life that distracted me from the spirit. Mighty prayer takes deep dedication. It takes implicit trust in the Lord. As I have listened to and obeyed the promptings of the spirit, as I have sought to have more powerful prayers, those promptings have guided me line upon line through the process. If we are diligent, humble, pure in our hearts and action, and we are seeking direction to further the Lord’s work on this earth, then the spirit can be unrestrained in our life. That is my solemn witness. 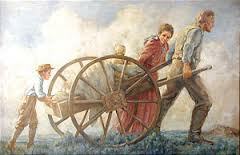 Synopsis: When the signs of the Savior’s birth appear, Nephi witnesses another miracle—the Liahona starts working again after 600 years of being idle! Determined to find and worship the King of kings, Nephi takes his brother Timothy and skeptic Cephus on a journey across the ocean that ultimately changes their lives—and the course of history—as they become the legendary Three Wise Men. 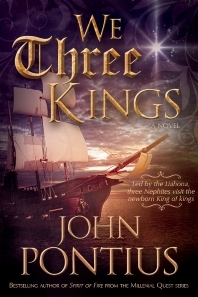 Sometime next month, Cedar Fort International will release John Pontius’ fictional book, “We Three Kings”. It’s story is not only entertaining, but also has a wonderful spiritual message which can be life-changing. At it’s heart, “We Three Kings” is about coming unto Christ — and encouraging others to come unto Christ — using (in part) the God-given tools we have in our possession. As these tools are miraculously activated, they lead us on wonderful, sometimes breathtaking, adventures which ultimately culminate in us finding ourselves bowing in His presence. All of us have similar stories of how we, too, have been led through (sometimes awe-inspiring, sometimes tragic) journeys which changed our lives and culminated in us discovering the Savior in a profound way. That’s why, starting today, I’m offering ten free copies of “We Three Kings”. Yes, there’s a catch: You need to submit your real-life story (about yourself or someone else who is alive and has granted permission for their story to be told) of coming unto the Savior. A few of us who run the UnBlog will read these submissions and will narrow the list down to ten. Then, soon after “We Three Kings” is released, we’ll contact the winners, send them their books and start publishing their stories on the UnBlog. Submissions must include your name, email address and phone across the top (when posted to the UnBlog, we’ll only post your name). They must be 800-1200 words long (any more or less than this will be disqualified). Must be based on events which really happened to you (or another; see above); no embellishing. If you can’t think of anything and need suggestions of topics to write about, please consult our Reader Submissions page. Should be done in Word. Must not have been previously published (they are “copyright free”). Must be e-mail attached and submitted to jmpontius@gmail.com by 11:59PM Sunday, August 31. It is not my intention to publish these in another book; just the UnBlog. I look forward to reading your stories of coming unto the Savior, in celebration of the forthcoming release of “We Three Kings”! Here is Part II of a blog post re: Saving Faith in Christ. Then comes the final requirement for obtaining saving faith: an actual knowledge that the course of our life is pleasing to God. If we are picking and choosing which promptings or which commandments we are going to obey, then this latter and greatest knowledge cannot exist in us. Only by obeying all of the commandments and all of the promptings does one come to this knowledge. And, it is possible to obey them all only because we correctly understand God’s unfailing love and eternal consistency in blessing the faithful. This is the glorious fruit of saving faith in Christ.